to the left and State Street off the map to the right. The Minerva Amusement Park was built by the Columbus Central Railway Co. as a destination on their new Columbus–Westerville interurban line. It was located northeast of Columbus between Cleveland Avenue and State Street south of what is now State Route 161. It opened July 13, 1895 one month before the arrival of the first Columbus-Westerville interurban car. The 150 acre property included a 15 acre lake created by building a 400 foot dam across Kilbourne Run. Amusement park buildings surrounded the lake. The map above pinpoints their location and the slide show photos, selectable on the left, show views around the lake. The park had many attractions to entertain visitors. The center piece was the 2500 seat Casino where comedies, dramas, operas and vaudeville shows could be staged. There were boat rides on the lake, the Water Chute that sent visitors screaming down a long slide to splash into the lake, an Ornithological Museum with a resident naturalist, the 250 foot Scenic Railway roller coaster that took the rider to displays depicting the tropics and creatures of the sea, pony rides, a dance pavilion, a deer enclosure and many other attractions. It would have been a treat in 1899 to leave the heat of Columbus and take a cool refreshing ride on an open streetcar to the country setting of Minerva Amusement Park, although there were times when the cars could be very crowded - See Packing A Streetcar. The 15 cent round trip fare included entrance to the park. By 1902 the Columbus Street Railway Co. had developed Olentangy Park located on North High Street only four miles from central Columbus. Apparently there wasn't enough business for two amusement parks. 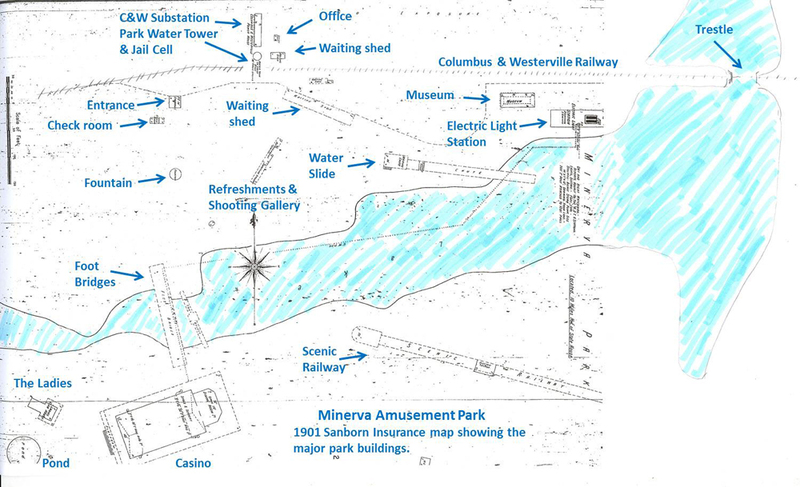 It was easier for the visitors to travel to Olentangy Park and so Minerva Amusement Park was closed. After the amusement park closed the Columbus Railway Power & Light Co. for a time stored derelict streetcars at Minerva Park. Company records show at least two cars - Nos. 371 and 372 - were purposely burned there in 1920. Over several years the park buildings were torn down and starting in the 1920s the land was redeveloped into housing. Today the village of Minerva Park with its eighteen hole golf course occupies the old parkland as well as adjoining lands that have been added to the village. The Westerville line continued to pass through Minerva Park until 1930. The track from Minerva Park north to Westerville was abandoned in 1929 and in 1930 the now streetcar line was cut back to Cleveland and Oakland Park Avenues.